The Amazon Echo was such a success when it first launched three-odd years ago that it managed not only to create a new category - the voice-controlled smart speaker - but also stay at the top of that category, even when its rivals muscled in. But three years is a long time without change, especially in tech circles, which is why Amazon has decided to give its Echo range a rather majestic makeover. The Amazon Echo has been given a massive redesign - it's no longer the plastic-fantastic device of old but something that will blend in nicely to your home, no matter how you've decided to decorate. This is all thanks to six new shells to choose from. 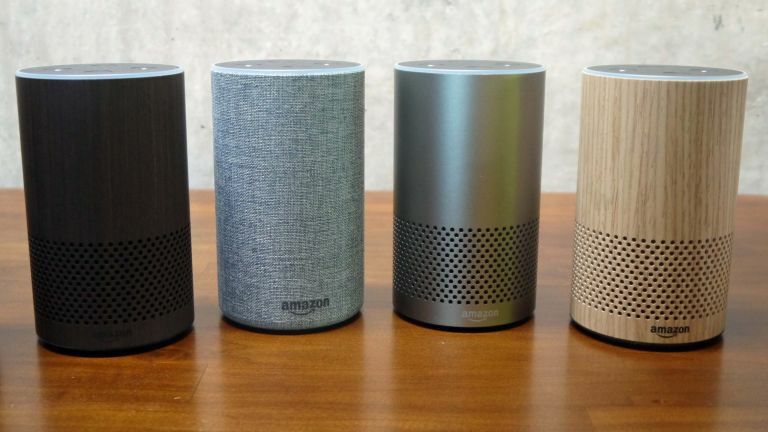 If you're still pining after the old Amazon Echo design then don't fear, as Amazon has decided to keep this design for its brand-new Echo, the Amazon Echo Plus. This supercharged Echo may look like the old one but there is a whole lot more going on under the hood. T3 has had a play with both of them at an exclusive event in Seattle and was impressed with what we saw. Looks-wise, the Amazon Echo is definitely the best of the two. It's a smaller form size than the original Echo, which means it's a bit podgier around the waist. While this isn't a good look on use mere humans it does look good for the Echo. You can see that Amazon has taken design cues from both the Apple Homepod and Google Home - the new-look is softer, more like a piece of furniture than the brutalist design of its predecessor. And there's six looks to choose from, all of which have flowery names such as: Charcoal Fabric, Sandstone Fabric, Heather Grey Fabric, Oak Finish, Walnut Finish and Silver Finish. Fancy. The new design also comes with some improved smarts. The speaker has been given a decent upgrade. There's now a 2.5-inch woofer inside as well as a separate tweeter. This did offer a sizeable sound improvement in the demo. Amazon has also refined the Alexa experience. There are a number of upgrades here that are worth mentioning. The first is something called Routines. This essentially means you can group a load of Alexa commands together and have a multitude of things happen with a voice command. So, you could have a Routine that turns on your lights, puts the coffee pot on the boil and switches on the radio when you say, "Alexa, morning". It's pretty much IFTTT but without the geek credentials. You now no longer have to tell Alexa what room you are in either. If you want the lights out in the dining room and are in the dining room, you just shout "Alexa, turn off the light". It's simplifying the process of speaking to your speaker and at the same time making things that little bit more natural. For some strange reason Amazon has opted to keep the old design of the Amazon Echo for the Amazon Echo Plus. Looks are deceiving, though, as underneath the hood are some pretty staggering changes that really make the Echo Plus the centre of your smart home. For a start, the Echo Plus has its own smart home hub built in. This means that it can connect to a multitude of smart devices without the need of an annoying bridge. In the demo we had, all we had to say was: "Alexa, discover my devices," and it figured out which smart devices were in the vicinity and automatically hooked itself up to them. There was no messing with Amazon Skills or apps, just straight into smart home heaven. You can also order the Echo Plus with a Philips Hue smart bulb. Sound-wise, Echo combines an all-new speaker architecture, a dedicated tweeter, a 2.5-inch downward-firing woofer, as well as Dolby processing. This meant that the bass was finally beefy (something an Amazon Echo hasn't managed to deliver before) and everything sounded that bit clearer. Amazon has delivered two enticing smart speakers with its latest reveal - both of which are worthy in their own right. If you are looking for something that will blend in with your home then the new Amazon Echo is for you - if you want something to make your home a whole lot smarter then it's worth taking a look at the Amazon Echo Plus. You can order both the Amazon Echo and Amazon Echo Plus now for £89.99 and £139.99 respectively.